You are here: Home � All Deals , Outdoors: Sports Travel Cameras � Own a Weber 40020 Smokey Charcoal Grill with lid lock for $34.70 shipped. Own a Weber 40020 Smokey Charcoal Grill with lid lock for $34.70 shipped. A lid lock, vents, and the Weber name make this grill a good buy. Amazon.com is starting to discount their BBQ Grills at the half way point into the summer season. 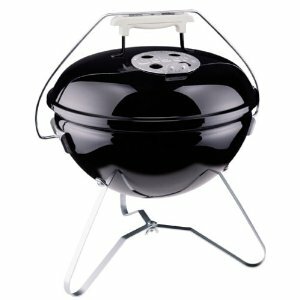 Our favorite pick currently marked down is the Weber 40020 Smokey Joe Gold Charcoal Grill for $34.70 shipped. One of the great features about this grill is the lid lock. Unlike most portable grills where you can bring them along on a trip or to the park and worry about the multiple pieces you have to carry - the Weber grill locks itself so it's in one easy to carry package. This is especially helpful when the grill is still a little hot (or even if you wanted to move it when on). Moving a grill without a lid lock in those situations would be a huge inconvience and a possible hazard. Lastly the Weber Grill name is one of the premium names in the industy. So the $34.70 price point makes it very financially friendly.